Maggie Bags are not only stylish. They are innovative, environmentally friendly and creative too. 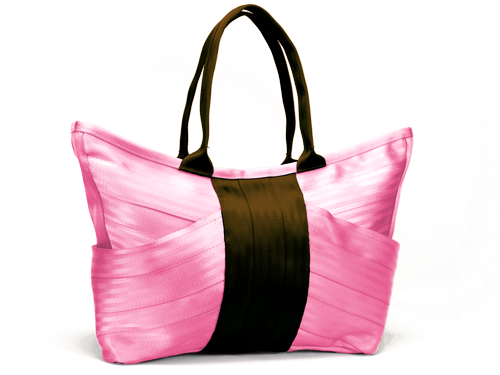 Maggie Bags began in 2009 out of a desire to find uses for materials made for other purposes. Every handbag Maggie Bags has to offer is made from automotive seat belts that have been rejected by auto makers due to government safety standards. With a devotion to environmental responsibility and a little creativity Maggie Bags has grown into an impressive company with an admirable result. Offering gorgeous handbags and re-purposing materials otherwise destined for a landfill. The lovely Mia of the Daily Fashion and Beauty News got a chance to test out a fabulous bag from Maggie Bags. This is one review you will not want to miss. I will warn you, you might develop a case of handbag envy. But, don’t dismay! You can enter to win a to die for bag of your own. This is the Pink Chocolate Butterfly Bag. It has a retail value of $104. This bag will make you the envy of your friends. Enter to win from March 5th-March 14th. The participating bloggers cannot be held responsible for the delivery of this prize. That is the responsibility of our sponsor Maggie Bags. This giveaway is hosted by the Sublime Media Agency, Sweet Silly Sara, The Daily Fashion and Beauty News and Woman of Many Roles.